This letter to Father Christmas was written by Geoffrey Washington Trevelyan, the youngest son of the politician Charles Philips and Lady Mary Trevelyan of Wallington (find out more about the Trevelyan Charles Philips Trevelyan here). 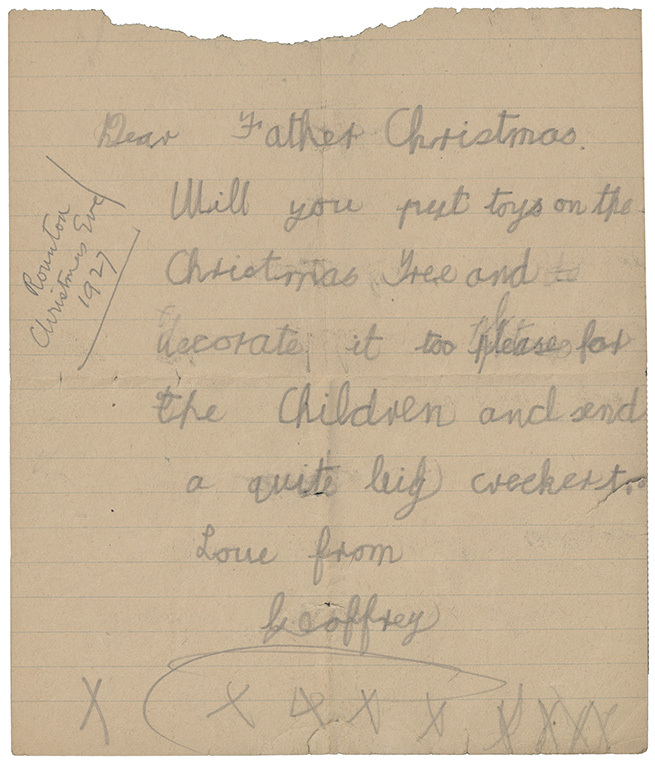 Written at his grandparents’ house Rounton Grange on Christmas Eve 1917, when he was seven years old. Geoffrey requests that Father Christmas decorate the tree and bring presents for the children. Geoffrey later became an engineer at de Havilland, and the 5th Baronet of Wallington. This entry was posted in Christmas Countdown and tagged #ChristmasCountdown, Christmas, Father Christmas, Rounton Grange, Trevelyan by nspeccoll. Bookmark the permalink.